Sub Plan J: OMG! GMOs! 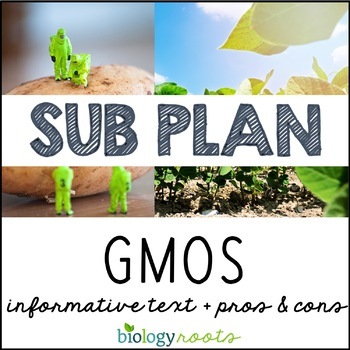 This is a 6 page sub plan that grabs reader's attention while delving into the hot topic of GMOs. 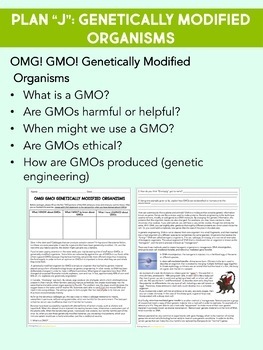 This document takes a non biased spin the GMOs and simply explains what they are, what they are used for, and poses some ethical questions (specifically in using chimeras). 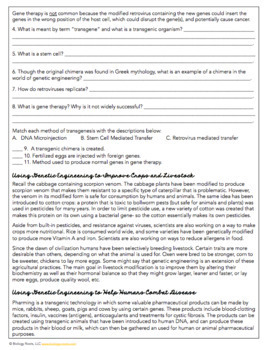 Students are also asked to make a table listing pros and cons of GMOs. Students will gain an appreciation of the scientific world and genetic engineering, and better understand genetically modified organisms to help them make thoughtful decisions. This sub plan is a useful tool to help encourage scientific literacy in reading, graphing, and making connections to the scientific world. This does not need to be exclusively used as a sub plan. Many feedback I have received is from teachers who used this in their classrooms as classwork. "Pharming is a transgenic technology in which some valuable pharmaceutical products can be made by mice, rabbits, sheep, goats, pigs and cows by using certain genes. These products include blood-clotting factors, insulin, vaccines (antigens), anticoagulants and treatments for cystic fibrosis. The products can be created using transgenic animals that have been introduced to human DNA, and can produce these products in their blood or milk, which can then be gathered an used for human or animal pharmaceutical purposes." Feel good knowing that your students will be well taken care of on those days that you are out- don't scramble for another sub plan! You can use this year after year! Plus, when you buy bundled, not only do you save $$, but you cover more time and you cover your you-know-what by being extra prepared with FIVE or FIFTEEN activities. The bundles also come with bonus documents to include for your sub! Plan A: An Inside Look at Cancer(Reading and Graphing). Students design a Facebook page using the biographies and templates included. Rubric is also included. Plan C- How May I Take Your Order? Explores fats, carbs, proteins, and how they add up on nutrition labels. Plan D- The Effect of Video Games on Your Brain- this activity takes a nontraditional spin on video games. It is based on evidence created in the lab of Daphne Bavelier. Plan E- Head, Shoulders, Knees and X-raysExplores common sports injuries (fractures, sprains, strains, swelling and and bruising. Explores the use of fossil fuels and the ramifications of using them. Students read, answer questions, and analyze a chart. Students learn all about the smallpox pandemic, and how Edward Jenner, James Phipps, and a milkmaid named Sarah were all heroes in coming up with a way to prevent this deadly virus. Optional timeline included for a multiple day absence. Generation Y relies heavily on radio waves for their Wi-Fi, cell phones, and video games. This explains radio waves, how radios work, and how cell phones work. Students analyze a pie chart about cell phone use. Students read this condensed version on the mystifying (and awesome) world of the immune system. In doing so, they gain a better understanding of allergies. 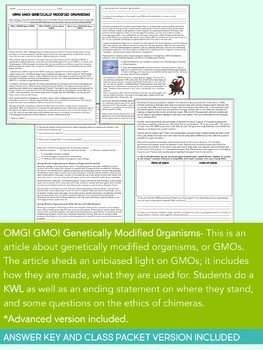 Students read this unbiased article about the construction and use of genetically modified organisms. Students answer questions within the text, and at the end are asked more ethical questions. Students explore the history and the science behind the cheesemaking process, specifically on enzymes and fermentation. This takes a non-biased, psychological spin on Big Foot’s suggested existence and why it is so important that we use the scientific method. Students form an experiment trying to lure Big Foot with apples. Students explore the mosquito and vector-borne diseases. Two version are included with this sub plan: an original version that introduces students to bar graph breaks when working with a wide range of data, and a graph-free version that omits the graph and includes a couple extra analysis questions. Students are introduced to the history of fossil fuel use going all the way back to Rockefeller, how it has affected our environment. Students explore how solar power: how it works and why it is a cleaner and more efficient alternative to fossil fuels. Students are introduced to the history and science of antibiotics, and how they are evolving to form superbugs such as MRSA.